I’ve been on an Indian food kick lately, as a friend of mine sent me a goody box full of Indian ingredients to experiment with. I’m new to the cuisine, intimidated by the long list of unfamiliar spices in recipes. How do I pronounce badi elaichi or hara dhaniya without sounding as if I’ve slammed five shots of tequila for breakfast? If I ask for methi seeds at the market, will the shopkeeper flip out and push the police button hidden under the cash register? Surely, very suspicious. But then I’m reminded by my friends that they feel the same way about common ingredients used in East and Southeast Asian cooking, such as nam pla, dong-gu and naganegi. My advice to friends who yearned to learn was to start with just one dry spice blend, such as five spice powder, and sparingly sprinkle on roasted vegetables. It’s inexpensive, simple and a great way to be introduced to Chinese flavors without having to invest in a cupboard full of one-hit wonders. It was time to follow my own advice and venture into the world of Indian cooking. My friend Sowjanya suggested I start with garam masala, a dry-spice mixture very popular in Indian cuisine. It’s a warming, aromatic blend of cardamom, cloves, cumin, coriander, cinnamon and black peppercorns, and it goes well with anything, especially vegetables. Green beans go from everyday to exotic with just a bit of this magic spice blend. Also try garam masala on roasted cauliflower, grilled fish or add to plain yogurt for a wonderful chicken marinade. But only use a bit at a time, as too much of this highly fragrant spice can be overwhelming. Find garam masala at most grocery stores. You also can buy it online at www.penzeys.com or www.spiceappeal.com. Heat a saute pan, and when hot, add nuts. Toast on medium heat, shaking skillet periodically until nuts are golden brown. Be careful not to burn them. Remove nuts immediately from hot skillet. If using skin-on hazelnuts, rub the nuts between towels to loosen and remove some of the skin. Roughly chop nuts. Set aside. In the saute pan, boil or steam green beans, covered for 5 minutes, or until tender. Drain and quickly rinse with cool water to stop cooking. Wipe pan dry, and return pan to stove. On medium heat, add butter. After 1 minute, the butter should foam and brown slightly. Add garam masala and fry just a few seconds until fragrant. Add green beans and salt; toss until beans are evenly coated. 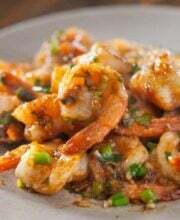 Taste and season with additional salt or garam masala if needed. Top with toasted hazelnuts. Indian food while delicious really requires an outdoor kitchen. A pinch of GM in chicken broth with whatever vegetables you have around and some noodles makes a quick and tasty soup. Hi Jaden, always enjoy coming here and seeing what you have posted as instant, fresh, tasty, simple and healthy food for dinner. I loved reading about you and your profession that is so closely related to food, and how your friend sowjanya started your experiments on Indian ingredients with the garam masala – the famous Indian spice powder that enhance the flavor of the food. You write so interestingly, enjoyed the bit wherein you have mentioned the difficulty in pronouncing Indian names :). Beans is a common vegetable in our kitchen for everyday Indian cooking, as an ingredient in soups, vegetables and rice dishes! 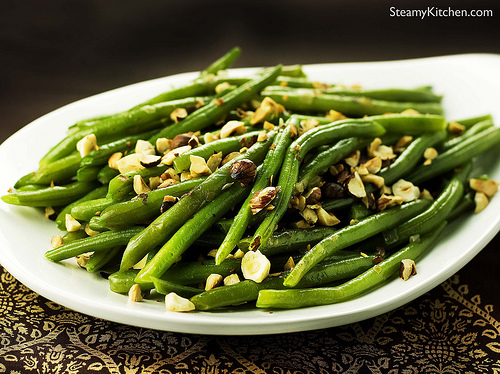 Your recipe is unique – butter coated steamed beans tossed in garam masala and garnished with roasted nuts – yummy! Will definitely try this one – guess the children will love the butter coated long uncut beans! 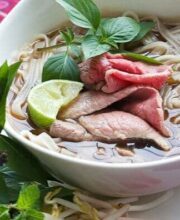 Amazing, this recipe is heathy is good looking (I love green). In China, we will fry it and adding some meat and oil together to fry. But your one seems to be raw, did you cook it? I’m just curious. http://www.kitchenware-info.com is my site, and you can find many cool kithen gadgets there. Green beans have to be my favorite vegetable. I love the idea of a garam masala too. I really like the flavors of Indian cooking. Very nice photo. I only use a tripod for the same reason. I also like your lighting system it beats the blue flood lights that I use. Have to see if I can find them. Thank you for sharing that. praise god for compound butters… underused but thoroughly delicious. love green beans, love garam masala, love hazelnuts, love butter. i get my garam masala from world spice merchants and it is to. die. fod. also, i know know why my photos will never, ever look like your photos. I love the beans recipe and I love the photo setup! 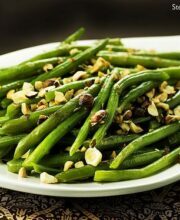 Wouldn’t have thought of adding garam masala to green beans, but I love the idea! And, of course, the photo helps that love along. I’ll pass on the laundry. Did 2 loads myself. That’s enough! Zenchef – That would be Sanjaya ;). Drop me a note if you want a pronunciation lesson! 😉 One of the perks for me of being an indian from thailand.. I can pronounce the ingredients from both of your lists! This post reminds me too.. I need to try to weasel my mom’s super secret garam masala recipe out of her again. It’s so good that several years ago at a school fair the chicken we were grilling smelled so fantastic we caused a vegetarian teacher to fall.. He couldn’t resist any longer! Short comment today, I need to go buy myself a jar of garam masala… Geesh awesome! Why are you ironing? What are you ironing? I gave it up after years of doing 7 shirts a week, long after permanent press arrived. Now my husband does the laundry and if he wants to iron…go for it! LOVE garam masala — first time was from the wonderful Time-Life series, Cooking of India, made it myself, roasted the spices in the oven. And if you don’t want “expensive” spices, find a place that sells herbs and spices in bulk so that you only buy what you’re going to use (in my store that can even mean one teaspoon!). Thanks for the inspiration. I am going to send you some of my personal garam masala mix. It is a mixture I created. I’ll send my hubby over, he does the laundry at our house (his mama raised him right). And those green beans look wonderful! I’m going to try this recipe for sure. Oh man, I’ll bet that’d be GREAT with some merquez sausages, yes. OH, and a cool, refreshing beverage. Mmmm, garam masala…love that stuff. This looks like a totally simple and delicious side dish, and I can never have too many of those in my life! This is an awesome recipe Jaden! I like the approach of trying just one new spice to see if you like it, rather than ending up with 5 (expensive) spices you really don’t care for cluttering up your cupboard with guilt. Welcome back! Great suggestion to try a new spice without being intimidated by it. I’m doing lots of laundry right about now, too. It’s the putting away that I hate. You can barely see our floor right now, haha! mmm, green beans. Those lights look like they would be perfect if i was still doing product photography. I had a makeshift light setup with a plastic bin! It was something alright. I have a deflector now which is weird after using that setup since you couldn’t use flash before and now you have to. I’d offer to help with laundry but the last time I ironed something, I burned a huge brown triangle into the back. The green beans look super yummy! I never thought of using pistachios with green beans. That’s definitely going to be dinner sometime this week. Those green beans look really yummy. I may have to make it tomorrow night. I need some more kid friendly recipes, as my 12 yo wants to help me prep dinner now. Darn kid is funny, he says he’s my sous chef. I tell him, you are more like a prep chef, since he’s relegated to starting pots of water to boil and fetching ingredients. The kid can make a pretty good side of sauteed summer squash though. Sorry about the laundry, no help here. I come back to a huge pile of laundry every time I visit my parents, and fat dogs too. The husband is sharing his fat ladened meals with the pups. Next time we go back to CA, I’m taking the husband with me, at least I won’t have a huge pile of laundry and the dogs can stay in a kennel and still be slim. Garam masala goes great with almost everything, but I loves the hazelnuts idea. I have had them with almonds loads of times, but hazelnuts? Mmmmmm. I happen to have some garam masala spice in my cabinet from when we did a Moroccan supper club a few months back… now I have a new recipe to try it on! Looks wonderful! I’ve been exploring Indian cooking lately and so far garam masala is my favorite thing. I find myself adding it to more soups and stews that need a little something extra. Thanks for sharing the photography insights — very helpful! I’m just becoming initiated into Indaina Cuisne. The spices blends are amazing. Lokking forward to see what more you cook from this area.Thanks for the photo tips! Always learning. Roasted cauliflower with garam masala is one of my absolute favorite things to make. I have no idea how something so healthy can taste so sinfully good, but it does! Mix a little olive oil with garam masala, salt, pepper, and garlic, and drizzle over sliced cauliflower. Roast at 400F for 25 minutes on each side (flip once), and indulge. I LOVE garam masala. I’m definitely going to have to add this to my easy side-dish repertoire. Oooooh! PENZEY’S!! I dream of someday having a Penzey’s store within easy driving distance! Meanwhile, ordering online, not only do you get the spices shipped to you, but you get their CATALOG with wonderfully useful descriptions of every spice and blend (and several recipes to boot!) Meanwhile, if you like the Garam Masala experiment(s), try their Sweet Curry too. Divine aroma. Like the lady says, you don’t have to take on an entire Indian recipe! Use it to do a change up on familiar favorites, or just put it in scrambled eggs done with a little bit of chopped onion. Mmmmmmmmmm. Garam Masala can have different spices mixed in so just check on the side of the spice jar first. I wanted some for cookies and was amazed to find some contained garlic and some didn’t. I really didn’t fancy garlic in my cookies because I am fussy that way! Here in England there is a wealth of lovely wonderful Indian spices. My Indian friends prefer to make their own garam masala mix and swear their special mix is the best and freshest. Your beans do look tempting. I am coming to help you with the laundry, and can be there in say…2 weeks. I am really good at laundry. Stains are a specialty. Such hidden talents! Oh, thanks for reminding me about this EGO lights Jaden… When I saw your other post I had noted it down and was going to buy it after I came back from vacation, but completley forgot! So, can I really manage with just one or should I get two? I’m guessing psychic laundry help ain’t no help. Maybe adds a little extra “vibe” to the agitator. I bet the boys would have fun with papadams.